Here's an extract of a review by Kit Ekman for True Metal Lives, May 2017. "After a few spins, I’m pleased to report that Led into Temptation is a very enjoyable release, indeed. It’s definitely true to Taylor and Denton’s NWOBHM roots, but it also moves toward more contemporary metal realms, on the one hand, and more in the classic rock direction, in the other. What I mean by that is that Midnight Messiah aren’t afraid to put some variety into this record. Songs like “The Merry Widow” (whose origins pre-date Elixir, if my information is correct) and bonus track “Right Place Wrong Time” both channel Thin Lizzy beautifully. Then there’s stuff like the high-octane opener “Second Coming” and the super-catchy “Go to the Light,” which capture the true NWOBHM spirit and will have you singing around the house for days. Denton (who is credited with most guitars, plus bass and the occasional keyboard) has a knack for strong riffs and melodies, and Taylor has that kind of ageless Biff Byford / Tony Martin voice: a little road-weary, perhaps, yet still rugged and laden with distinctly British character. Two songs, in particular, are worthy of emphasis. Proper album closer “While Heaven Bleeds,” is a six and a half minute tour de force with a towering, foreboding Iommi-esque riff, a lumbering tempo, and an emotional vocal performance from Taylor. The song suddenly takes off at the four and a half minute mark with a gold-plated riff, a somewhat faster tempo, and the most gripping vocal on the album. Stirring stuff. Then there’s “The Sinner Must Die,” sporting a tough-as-nails riff, a devil-may-care attitude, and a relentless, hard-driving beat, interspersed with a beautiful guitar harmony in the chorus section and even a glorious Maiden-type bridge. The whole album’s worthy, but “While Heaven Bleeds” and “The Sinner Must Die” earn top marks for sure." "Hard Rock Hell has a deserved reputation for bringing together classic acts with the best of rising talent, and openers Midnight Messiah (https://www.facebook.com/MidnightMessiah) proved this point right from the off, as they took to the stage at the seemingly unmetallic hour of 6pm on the Thursday evening… Having arisen from the ashes of the legendary (in their own lunchtime?) Elixir, the London five-piece kicked off the weekend in fine style, with their updated, classic NWOBHM sound very much in the vein of Saxon – especially in Paul Taylor’s earnest vocals – delivering a generation-spanning set of pure, honest, straightforward metal enjoyment". You can read the full festival review here. "I know that a festival is never a competition, still some shows you always like better than others. For me the first huge surprise of the day came in Midnight Messiah. I had their CD, but did not have the Elixir albums (quickly got them after the show as they were available on CD or vinyl) This band had a diverse show, great songs and they turned out to be a band that makes you wonder why did they not break big again? A band to follow closely, hopefully I can make it to Heavy Metal Maniacs in October". "I awaited the arrival onstage of Midnight Messiah. Now this band are another newish band, but unlike Toledo Steel they are not made up of young musicians. 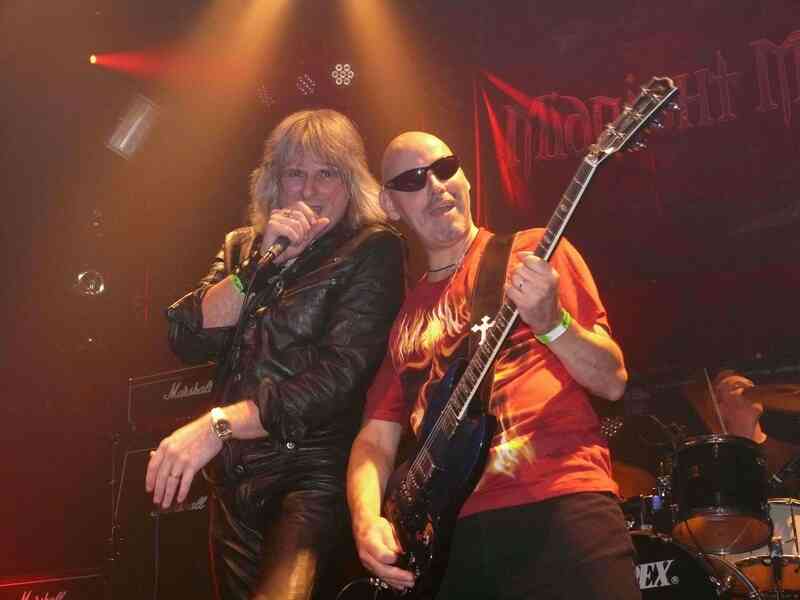 Vocalist Paul Taylor and guitarist Phil Denton are former members of Classic NWOBHM band Elixir. I loved Elixir back in the 80's but never got to see them live. They finally disbanded in 2012 but thankfully Midnight Messiah were born and this gig was a dream come true for me because the band had decided to put some older songs into the setlist which went down a storm. They didn't overshadow any of Midnight Messiah's own material though. Their debut album 'The Root Of All Evil', which Paul very kindly gave to me is a storming beast, reminiscent of Saxon and Demon and live they are a force to be reckoned with. Young guitarist Dave Strange is a real talent and 'The Evil One' is a song destined to become a metal classic. When they had finished their set you couldn't wipe the smile off my face!"